Love the cover! Reminds me of both Marin and Rebecca. Lonely and stagnating in a soulless job, thirty-seven-year-old Marin Ellis is in need of a new start but she is not prepared for the one she is given, when, after her estranged father and his second wife die in a car accident, she is made guardian of her fifteen-year-old half-sister Rebecca. The half-sisters are practically strangers, and their life in Hampshire is stilted and strange. At Rebecca's pleading they move to the picturesque village of Goswell on the Cumbrian coast, settling into the charming Bower House on the edge of church property. When a door to a walled garden captures Rebecca's interest, Marin becomes determined to open it and discover what is hidden beneath the brambles. 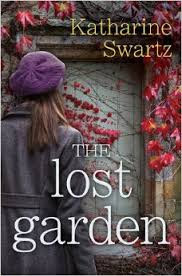 She enlists the help of local gardener Joss Fowler, and together they begin to uncover the garden's surprising secrets. I want to jump up and down like a maniac because this such a perfect read for me! I love it when someone has to take on a child - a teenager is as much of a handful as a toddler, if not more so! It's not as if Marin even had much contact with Rebecca previously, who is struggling with the loss of her parents and having to start afresh in somewhere which is remote. It takes an awful long time for Marin to breakthrough to Rebecca that she is there to support her through the ups and downs. You'll need tissues when progress is made in their relationship! I liked the exploration and discovery of the hidden garden, which really felt like The Secret Garden story. Occasionally It takes a lot of knockbacks before she settles in to her new life, finding joy in few things especially when Rebecca is acting up and Marin has no one to turn to. I was a little disinterested in the flashbacks, but they are really important and have a huge impact on Marin's current life. I felt sorry for Eleanor because due to the time she lived in she wasn't able to freely love who she wanted as her friendship with Jack developed. I liked seeing the similarities between her situation and Marin's, which thankfully has a happier ending.